Rosenkuppel Oregano is spectacular in the garden. Large nodding flower heads cover the dark green mounding foliage throughout the summer. 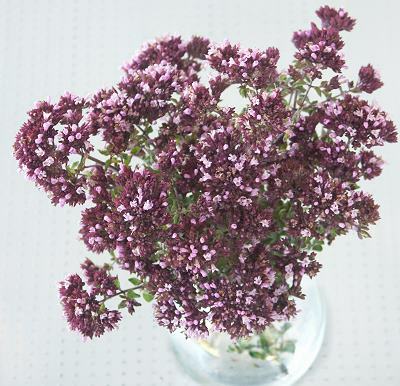 It is easy to grow and the flowers retain their color even in the hottest, brightest locations..
Like most oreganos, Rosenkuppel Oregano should be cut back to the ground in early fall. Each spring the crown will get a little wider and produce more blooms. Flower stems can be cut anytime before they start to brown. They can be used fresh in crafts like our Herbal Wreaths or hung to dry and used later. They look great even in a simple bouquet like the one below. Add a nice bunch of Baby's Breath or Powis Castle Artemisia to really make the vibrant purple flowers of Rosenkuppel pop. 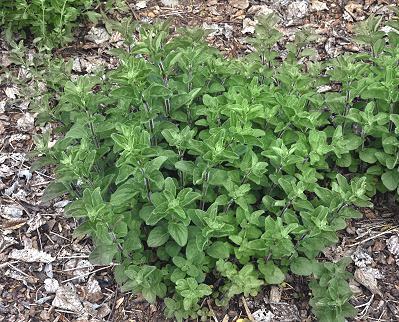 Rosenkuppel Oregano is one of the six plants chosen to be in our Crafter's Herb Garden Six Pack. This plant is sometimes available in plug trays. These trays hold 128 of all the same plant. They are a great low cost way to fill a lot of space. Each cell is 3/4 of inch by an inch. Check here to see if Rosenkuppel Plug Trays are available.